Photo by Sofia Photo Agency. Strong winds are expected across Bulgaria beginning of next week, as fall weather continues to be dynamic, but still warmer than usual. 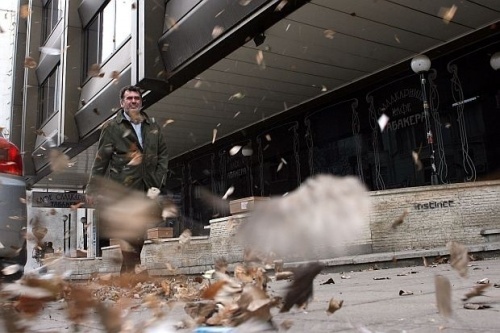 Forecasters at the National Institute of Meteorology and Hydrology at the Bulgarian Academy of Sciences warned of gusts up to 90 km/h across Bulgaria for Sunday night and early Monday. Code "Orange" for danger is set for nearly half of Bulgaria's regions due to expected high winds, with almost all of the rest set to code "Yellow" for caution Monday. Winds will be southerly, then from the west. Lows will be 10-15 degrees Centigrade, around 3-5 for the North-west. Highs will be above 20 C for some places, which means new temperature records. Tuesday and Wednesday winds will subside, temperatures will fall a couple of degrees, with rain setting in. Then Thursday and Friday new gusts from the South are expected, with temperatures returning to 15-20 C.
Weather will deteriorate Saturday, with some snow possible over the night in what promises to be a dynamic week.